Has Hollywood completely run out of original ideas? You might think so by looking at any upcoming network TV or movie production schedule. Disney is remaking its classics in live-action format while TV reboots everything from the '80s and '90s — Roseanne, Murphy Brown, Magnum P.I., Will & Grace, even Fraiser. Here's what we know about all of the old favorites due to come back around, for better and worse. 9 to 5: Confirmed as a sequel with Dolly Parton, Lily Tomlin and Jane Fonda on board, according to Fonda. Aladdin: The live-action remake directed by Guy Ritchie stars Mena Massoud as Aladdin, Naomi Scott as Jasmine and Will Smith as Genie. Due in theaters May 24, 2019. Alf: Rumored. Warner Bros. is in the "early stages" of developing a series based on Alf, according to sources. Big Trouble in Little China: A sequel, not a remake, starring Dwayne "the Rock" Johnson. It was reportedly originally a remake with Johnson as Jack Burton. But "you can't remake a classic like that," sources say. Buffy the Vampire Slayer: A reboot is in development at Fox 21 Television Studios, with Monica Owusu-Breen as writer, executive producer and showrunner and Joss Whedon as executive producer. Owusu-Breen recently tweeted that there is only one Buffy and implied that the show will follow a new slayer. Cagney and Lacey: CBS decided not to pick up the reboot starring Grey's Anatomy's Sarah Drew and Blindspot's Michelle Hurd as a pair of female police detectives in L.A., as originally made famous in the '80s with Sharon Gless and Tyne Daly. Cannonball Run: "In talks," for the second year. Charlie's Angels: Confirmed, due out in September 2019 with Kristen Stewart, Naomi Scott and Ella Balinska. Directed by Elizabeth Banks. Charmed: Premiering Oct. 14 on the CW with new stars Melonie Diaz, Sarah Jeffry and Madeleine Mantock as the three witch sisters. The old cast is not too happy about this remake. Produced by Jane the Virgin showrunner Jennie Snyder-Urman. Conan the Barbarian: Amazon is developing a series based on the 1982 movie that will simply be called Conan. Creepshow: Greg Nicotero (The Walking Dead) will turn Creepshow into an anthology series for Shudder, a horror streaming service, in 2019. The 1982 movie featured stories written by Stephen King and directed by George Romero. 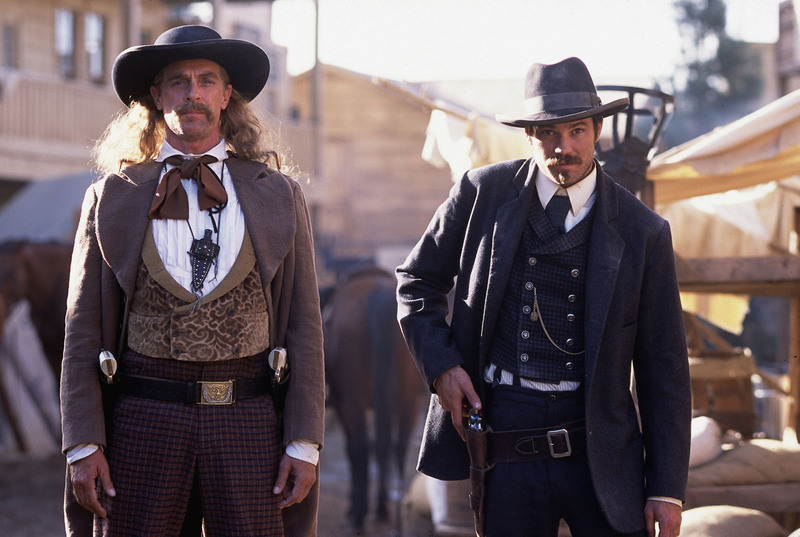 Deadwood: In production as a sequel movie due out in spring 2019, according to HBO. Designing Women: The creator of Atlanta-set show has been searching for a home for a revival of the late '80s series. Dumbo: The live action movie directed by Tim Burton and starring Eva Green and Colin Farrell is due out March 29, 2019. Watch the trailer. The Facts of Life: Leonardo DiCaprio and Jessica Biel are in early talks to executive produce the series. Fraiser: In early talks, with Kelsey Grammer reportedly "working on ideas." Greatest American Hero: Hannah Simone from New Girl was tapped to play the reluctant superhero made famous in the '80s by William Katt, but tweeted in May that ABC had abandoned the series. Gremlins: A reboot, not a sequel, according to writer Chris Columbus. Heathers: Postponed in the wake of the Parkland shooting, the series now seems unlikely to ever see the light of day. It dropped off of the former Spike TV when it rebranded to Paramount and was shopped, but doesn't look like it found any takers. Howard The Duck: Actor Lea Thompson – who starred in 1986's Howard the Duck – says she's going to pitch Marvel on a remake of the film. Indiana Jones: The fifth movie is still reportedly coming with Harrison Ford, but it's not due out until July 9, 2021. Ford will be 79. The Last Starfighter: Confirmed, by Rogue One screenwriter Gary Whitta. Details? Those are sketchier. Less Than Zero: Hulu is developing a TV series based on the 1987 film that starred Andrew McCarthy, Robert Downey Jr., Jami Gertz and James Spader. Mad About You: "It likely won't happen," according to Paul Reiser. He said it's stalled on the studio's end, despite him and Helen Hunt being on board. Magnum P.I. : The new series starring Jay Hernandez — sans mustache! — is set to premiere Sept. 24. Murphy Brown: Premieres Sept. 27 on CBS, with Candice Bergen and most of the cast returning. Pet Sematary: Confirmed remake, due out April 2019. Police Academy: "In a gift bag being readied," star Steve Guttenberg told a fan on social media. He also said: "No details yet." RoboCop: A sequel called RoboCop Returns is in the works, with Neill Blomkamp (District 9) directing and original star Peter Weller possibly returning. Roseanne: Canceled, obviously, but then spun off again as The Conners without Roseanne Barr, due for October release. Roswell: CW has confirmed Roswell: New Mexico for a 2019 release. Based on the same set of books of the WB/UPN drama, but the story has aged up the characters, so the star-crossed lovers are now Liz (Jeanine Mason), the Mexican-American daughter of undocumented immigrants, and Max (Nathan Parsons), Liz's teenage crush who is now a police officer — and secretly an alien. Sabrina the Teenage Witch: The Netflix reboot The Chilling Adventures of Sabrina stars Kiernan Shipka (Mad Men) as Sabrina in a version darker and more serious than the original ABC series that starred Melissa Joan Hart. From the creator of CW's Riverdale. Premieres Oct. 26. Terminator: Linda Hamilton is expected to return as "Sarah Connor." And Terminator 6 will in fact be a sequel to 1991's Terminator 2: Judgment Day. Top Gun: Top Gun 2: Maverick is in the works, but now delayed for a year until June 2020. It was originally set to be released July 2019. Tom Cruise has been tweeting from the set, and the cast also includes the return of Val Kilmer plus Jon Hamm, Ed Harris, Jennifer Connolly and Citrus County's own Miles Teller as Goose's son. Will & Grace: The second season of the revival is due to premiere Oct. 4. Willy Wonka: Rumored, with Donald Glover and Ryan Gosling reportedly on the short list. The X-Files: After 2018's Season 11 saw a huge dropoff in viewership, Fox has said it does not have plans for more; Gillian Anderson also said she is done with the series. In a way, this felt like the end. Creator Chris Carter, however, has other plans.